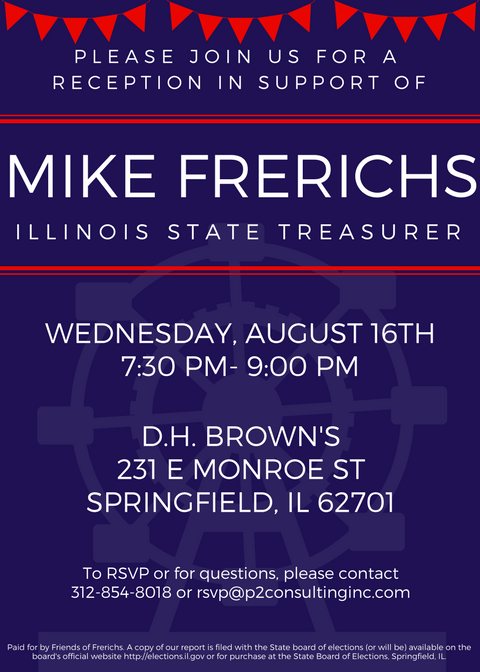 UPDATE: Frerichs for Illinois – Friendraiser this Wednesday! Due to the General Assembly being called into session, we can no longer host a fundraiser on on Wednesday, August 16th. However, we would still love to see you so please join us for a "friendraiser" instead! We'll be at DH Brown's (231 E Monroe St, Springfield, IL 62701) from 7:30PM - 9:00PM. Please RSVP HERE or see the invitation attached below for further information. If you have any questions, please feel free to call us at 312-854-8018 or reply to this email. Looking forward to seeing you Wednesday for a night of food, beverages, and friends!